Delving into the detail, I was pulled toward the differentiation between sculptural and layering techniques and the contrasting elements between a hard (sculptural/masculine) look versus a soft (layering/feminine) look. 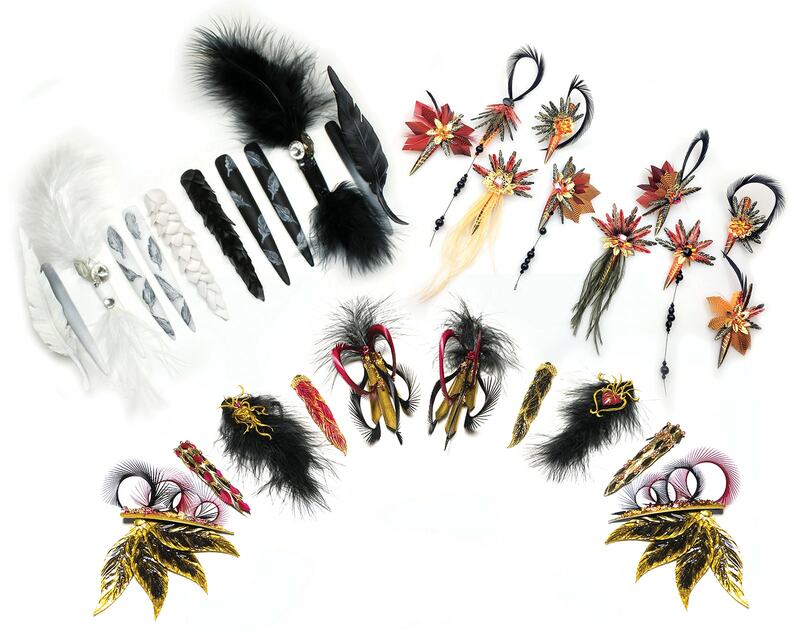 With the hand-made (Manus) element in mind, I created different sizes of feathers through the use of different sizes of nail tips, whilst combining gel-polishes, gel blending, and pigments with individual hand painted feather detail. From there, I shaped the feathers to allow them to be placed together to bring my concept to life. I was able to secure a few pieces of machine-made feathers with natural plumage that I altered to suit the design. I also brought together metal feathers, which I believed amplified the look. I continued to incorporate Swarovski crystals and core colors that were previously used, but introduced dark gold, brown, and maroon with the contrast of vibrant orange and golden yellow. These colors represent class, quality, strength and boldness, yet are a regal view of high fashion. Jan’s Feedback: Once again you have delivered a beautiful and dynamic set of nails! The blend of masculine and feminine elements really works and the hand-made feathers are gorgeously detailed. Your color story is rich, textural, and truly inspiring. Upon first glance of your work, we knew it was yours. This is great because you have a trademark artistic style, which makes you a champion. However, the composition of your work might be too familiar at this point of the competition. I advise utilizing the next challenge to take a giant leap of faith and try something totally new! Is it possible? If it is, you could be NAILS Next Top Nails Artist! I continued on my color theme from the previous challenges and made the nails black and white. I used dyed feathers and machine-made rhinestones on my set for the Machina part and hand made everything else. I painted feathers inspired by watercolor prints in fashion. Thin acrylic triangles were layered to resemble feathered gowns. I made similar 3-D feathers using acrylic and brought the set together with actual feathers. Jan’s Feedback: We loved seeing you work with color last week and look forward to continued exploration of technicolor. That said, we also love your black and white story for its clean and sophisticated statement style. One caution is that it has a tendency to be slightly underwhelming. Praises for the simple and to-the-point tutorial. It was very easy to follow and replicate. We’re rounding the bend to the final challenge, so surprise us! It’s time to overwhelm in order to become NAILS Next Top Nails Artist! For this particular challenge I was driven by an image that I found in my research showing off spiky feathers, and wanted to incorporate the less traditional feathers into my design. I also wondered how I could create even more interest in this design, so instead of only focusing on the top of my design, I took the design to the bottom of the tip too. The color palette for this design is rich and luxurious with the golds, blacks and Bordeaux red, but also has an antique feel to it. It depicts hidden treasures as I want the viewer to look at each tip and discover something new and exciting. A great deal of my inspiration came from Melissa Ng of Lumecluster, an artist that creates 3-D masks, armor, and fantasy art. This is where the mask idea came from. Mine was not done through 3-D printing, but with a combination of monomer, polymer, and LED gels. 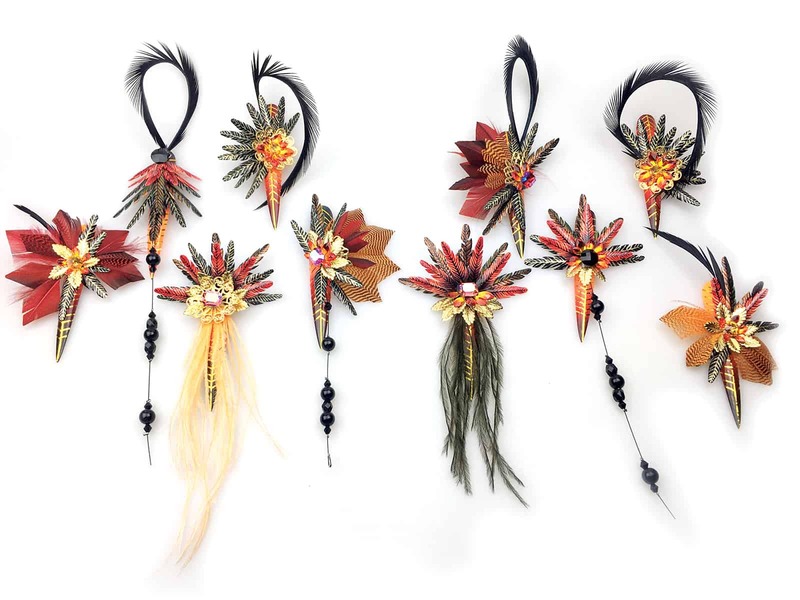 I worked with mixture of real, synthetic, and handmade feathers to show some variety in the design. For the feathers at the base of the tips, I initially contacted a 3-D printing company to find out what the design and printing of 40 feathers would cost. After receiving the quote I realized very quickly that I would need to get creative and make them. The idea behind the feathers at the base of the tips is that I could envision models walking on the catwalk, firstly with their hands at their side which would only allow the top part of the design to be visible. Along their walk, they would stop and strike a pose and in lifting their hand the feathers would fan out. My idea was to design a set that offers dimension, inspiration and the element of surprise. Jan’s Feedback: You have created a magnificent set of dramatic, runway-worthy nails, filled with surprises and elevated techniques. Your innovative approach and fresh thinking demonstrates creativity and extreme excellence at its highest level! Great writing and unmatched ambition. This is championship work and you keep raising the bar. What will you do to surprise us next time? When we see you might just become NAILS Next Top Nail Artist!